What the 20-year plan for better bus and rail service does and doesn't do. The last 60 years of Denver’s development has tethered entire generations of people to personal cars. The next 21 will be, supposedly, about cutting that cord. This post is the second in a series examining how the city’s “Denveright” plans might — or might not — make walking, biking, and transit legitimate options for everyone. These plans are in draft form. You can comment through October 31. Two years after the Hancock administration set out to reshape the city’s bus and train network with Denver’s first-ever transit plan, Denverites still don’t know precisely how much it will cost, where the money will come from, or what will be built where by when. 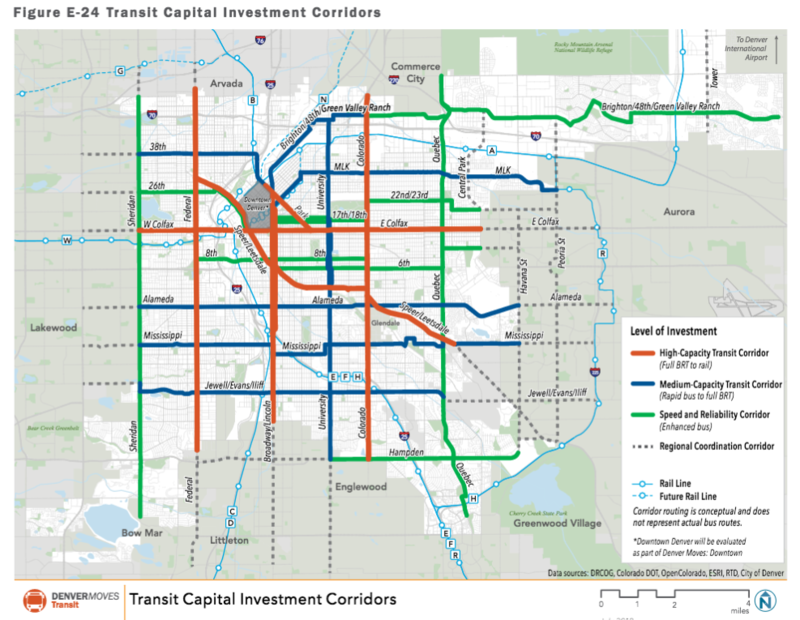 While important pieces remain undefined, the plan provides a framework that positions Denver to vastly improve the urban transit network, a responsibility once solely on the shoulders of the Regional Transportation District. Those are some revelations following Monday’s unveiling of “Denver Moves: Transit,” one of five documents released after the massive citywide planning process known as Denveright, launched in 2016. The 454-page plan identifies 19 corridors due for small, medium, and large investments over the next 20 years. The goal? Create a frequent transit network where buses and trains come every five to 15 minutes. Within five years, residents will see marginal improvements to some bus corridors with more frequent service, the plan states, possibly by paying RTD for operations. But it will be 2040 by the time Denverites see overhauls to just five corridors slated for major investments — think Colfax bus rapid transit or streetcars — out of 13 identified. 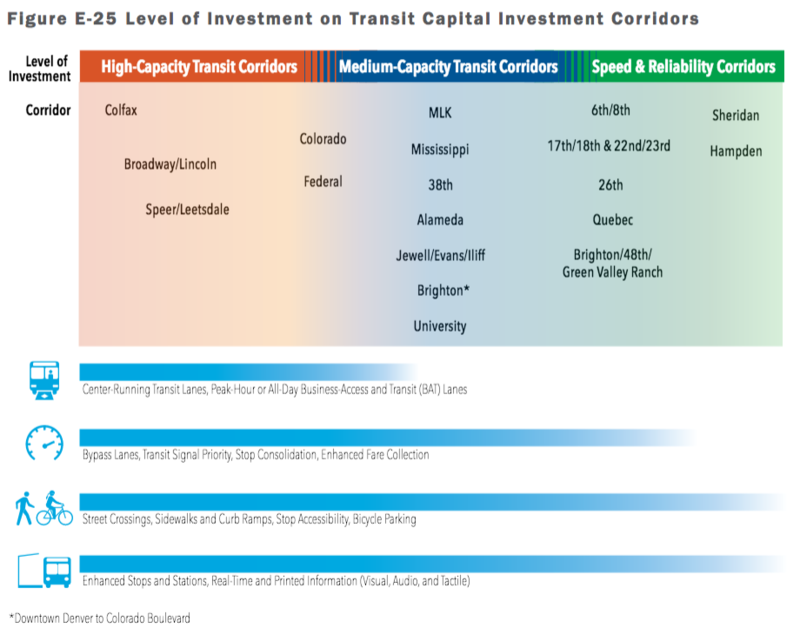 During a meeting with reporters last week, city officials insisted the transit plan is strictly an “aspirational” document meant to point Denver in the right direction. City documents, however, show funding mechanisms, implementation strategy, and project prioritization as intended deliverables [PDF]. The build-out of a platinum-level transit network with lots of bus lanes, bus rapid transit, streetcars or light rail, signal priority, and bus stop upgrades would cost $5 billion, according to very rough estimates in the plan. The bare-bones version would cost $1 billion. Denver Moves: Transit does not recommend funding sources to pursue, like a massive tax measure or higher fees from parking meters. Instead, the Hancock administration will begin a “phase 2” that examines funding options, refines costs, and prioritizes projects. Denver Public Works has just one person working on transit issues full-time, and she was hired to manage this plan. Denver Moves: Transit calls for the establishment of a “transit program.” Essentially, this means that transit stuff will receive the same treatment as bike and pedestrian stuff. Engineers and planners will be hired to improve streets, policies, and funding for bus and rail service. Cleckley would not say how many employees the department will hire, but he will request the funds from Mayor Michael Hancock this budget season. A bus caught in general traffic lanes won’t be on time, but RTD can’t just order up a bus lane whenever it wants. The city, not the transit agency, controls the streets that dictate whether RTD serves Denverites well. Paying for extra RTD service is one option. But the agency can’t even hire enough bus drivers to deliver on the current service promised to riders. Regardless, the city and RTD will have to work much closer together in order to pull off upgrades. The documents released today are technically drafts for the public to review and comment on before being finalized. Stay tuned for coverage of this plan, as well as the Denveright plans for pedestrians and land use. How can it be so difficult and expensive to paint bus lanes on five corridors? Just start! Stop overthinking it and start putting down paint! Whatever gets put down will probably end up changing over time anyway so start cheap and lay down concrete when it’s working! Bus lanes require paint, signage, and political will. I don’t think there’s a shortage of paint or signage. Political will sounds about right. There’s a couple of issues. First bus ridership in Denver is on a multi-year descent, down 8.6% from 2016-2017 (APTA still hasn’t published any 2018 quarterly figures). Second, RTD is budget-constrained including having a shortage of drivers. While Denver is going to consider a ‘buy-up’ of service from RTD, how much money is the City willing or able to spend for buses, drivers, fuel, maintenance and repairs? Obviously, paint is the easy peasy part. Bus lanes would also increase ridership (and revenue) and decrease costs. Financially, it’s a win-win. I follow a little bit what’s going on in Seattle which is very different from Denver. Consider the construction disruption of building a dozen skyscrapers over 38 stories plus their convention center rebuild. They’ve been instituting designated bus lanes in various spots but all are within the downtown core (which is larger than Denver’s). Actually, they call them BAT lanes. The issue for the City of Denver is that they just started a pilot program for dealing with the opioid mess (per Denverite). Add that to affordable housing needs, desire to create more bike lanes and sidewalks, growing security costs ie fire and police and it becomes a growing challenge to decide how to allocate limited $’s. In fact there will be up to 5 different initiatives seeking dedicated funding on the Nov ballot; that’s just in Denver. The Parks initiative is most likely to easily pass IMO. 2) Better transit helps with affordability, so it gives people without access to a car more options for where to live (and still get to their job) / more options where to work (and possibly earn more money). Fine by me. I haven’t been arguing against so much as making observations of what I assume will be obstacles. There are plenty of quick fixes that could be implemented easily. The transit signal priority upgrades recommended in the spring still aren’t in place. I asked the 10 bus driver recently and she hadn’t heard of it. Also, I don’t know why we need to wait for a “downtown denver moves” plan next year to create bus only lanes on 15th and 17th streets which are the most important transit corridors in the city. At the risk of being rude: This is a Big Nothing Burger. To be fair, I respect the enormous amount of time and effort that went into this. Looking out to 2040, my personal preference is for a much higher level of service (than some might suggest). They’ve estimated light rail costs at ~$81 million per mile. (IMO) that’s no platinum-level light rail; it’s more like a no-frills, ride-at-your-own-risk cost. Sheesh. I’ll be dead by 2040, or at least too feeble to walk over broken sidewalks to get to transit corridors. I have trouble doing that now.